3. Dowsing Archaeological Features - How does dowsing work? 3. How does dowsing work? 1. Divining rods and all common dowsing devices, are the simplest forms of electroscopes. The divining rods are charged with static electricity from the dowser's own body. This static electricity can be measured empirically with a simple millivolt meter. 2. Dowsing uses a few simple tools to emphasise small movements in the hand. These movements occur automatically as our bodies sense the subtle energies emitted by everything around us. 4. The dowsing reaction is caused by moving the electrically charged body of the dowser over a magnetic anomaly. The bundle of nerve endings in the wrists causes a rotating flux, just as in an electric motor, which rotates the rods or twitches the hands. 3. The cover of J.Scott Elliot's book showing Scott Eliot using a V-rod. His belief in dowsing is beyond the mechanical and relies on a profound self-belief in the innate nature of man. 5. 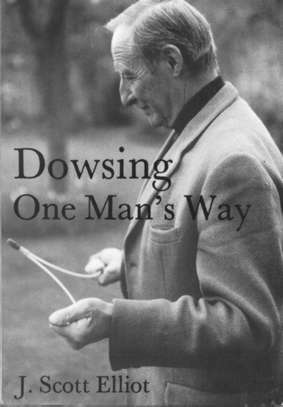 Dowsing is "The ability to use a Natural Sensitivity which enables us to know things we cannot know by the use of the day to day brain or by learning, by experience, or by the use of the five physical senses." Scott Elliot. J (1990), (Figure. 3). 7. Dowsing is a fraud and the findings are actually based on close research of history, geology and human nature. It is beyond the scope of this work to try and discuss the merits of all of these viewpoints but it must be stated that the author does not believe that items 5 to 7 above have any place in an empirical study and is inclined to place them on one side for others to debate. The authors own viewpoint for the record is that items 2 and 4 are the most likely explanations and are closely allied to each other. However the study questionnaire will investigate viewpoints 4 and 8 by asking for details on eyesight and wrist jewellery.